I must admit, I don't tend to give hand creams an awful lot of thought. They just aren't a product I consider very often and I rarely spend money on/ get excited about stuff to slather on my hands. There is one exception to the rule though that comes in the form of the iconic product that is Clarins Hand and Nail Treatment Cream. I first discovered this stuff in a Clarins gift with purchase years and years ago and it's remained a firm favourite ever since. I bought a new tube just the other week and once again rediscovered its wonders so if you're not already a devotee here are 5 good reasons to love this hand cream. The texture of the cream is really, well, creamy yet it absorbs beautifully and doesn't get you all greasy and gross. A little bit really does go a long way too. 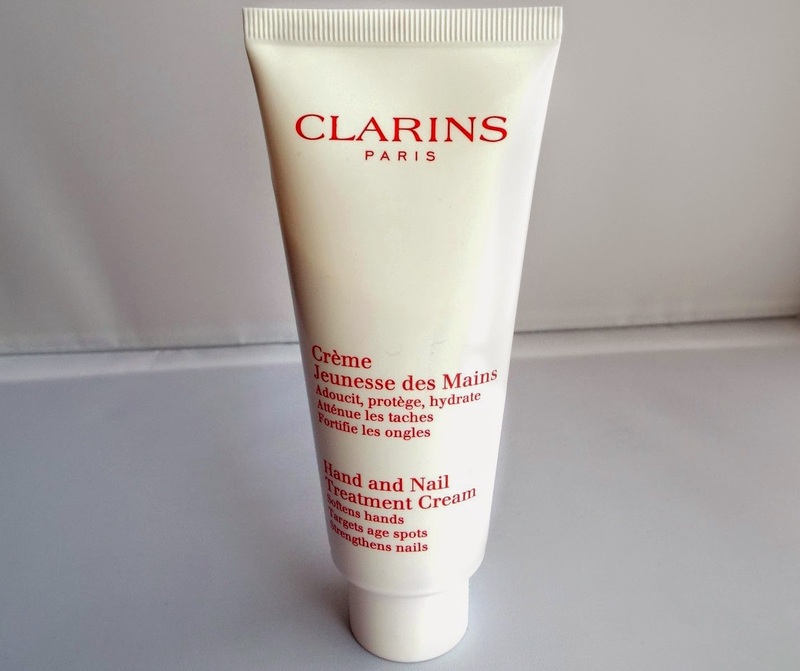 The scent of Clarins Hand and Nail Treatment Cream is just so typically Clarins. It has a really pleasant, almost organic, earthy fragrance that I imagine might not be everyone's cup of tea. The plant based ingredients really shine through in the scent and make it one of my favourite things about the product. Sesame Oil, Shea Butter, Japansese Mulberry extract, Condurango Bark and Myrrh extract combine to protect and nurture and reduce discolouration such as age spots. Apparently it's the Japanese Mulberry extract that's responsible for reducing age spots, Myrrh extract works at strengthening the nails and Condurango Bark (a type of tropical plant) stops the palms feeling damp while the Sesame Oil and Shea Butter protect, moisturise and revitalise. I'm not sure if I've lost my mind or not but this is the only hand cream I've tried that instantly makes my nails feel stronger. It's a little bit bizarre really but it really does seem to sink into the nail instantaneously and strengthen them immediately. This alone is a great reason to add it to your stash but it also absorbs into the hands really quickly and leaves them beautifully soft without any greasiness. Classic Clarins packaging is just beautiful in my opinion. Clean, simple and chic, the 100ml white bottle with red text is a timeless winner. The tube is light and durable enough to throw in your handbag too which is always a bonus (also available in 30ml) and I always manage to squeeze out the last drop with ease. All in all, I really, really like Clarins Hand and Nail Treatment Cream. What's your go-to hand cream? Clarins Hand and Nail Cream is available in Boots, at department stores and pretty much everywhere online for around £21.